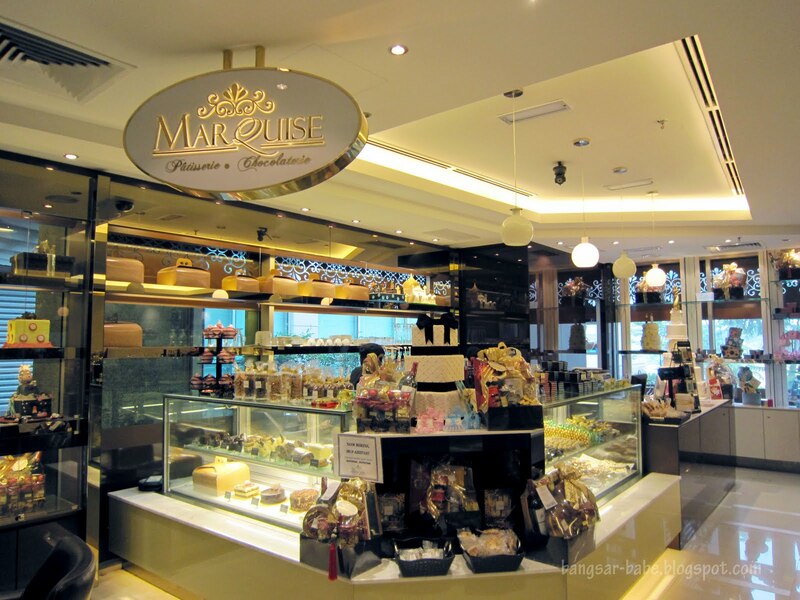 Marquise has been open in Bangsar Shopping Centre for more than half a year. I know that because rif and I would walk past it each time we hang out in the shopping mall. Located at the back corner on the ground floor, Marquise displays beautiful cakes, an assortment of artisan chocolates, cookies and cakes. We actually checked out the place when it first opened, but things didn’t feel quite ready. One would be spoilt for choice here; I know I felt like Gretel in “Hansel and Gretel”, minus the wicked witch. I wanted to try their afternoon tea, but decided against it as we had a rather heavy lunch. 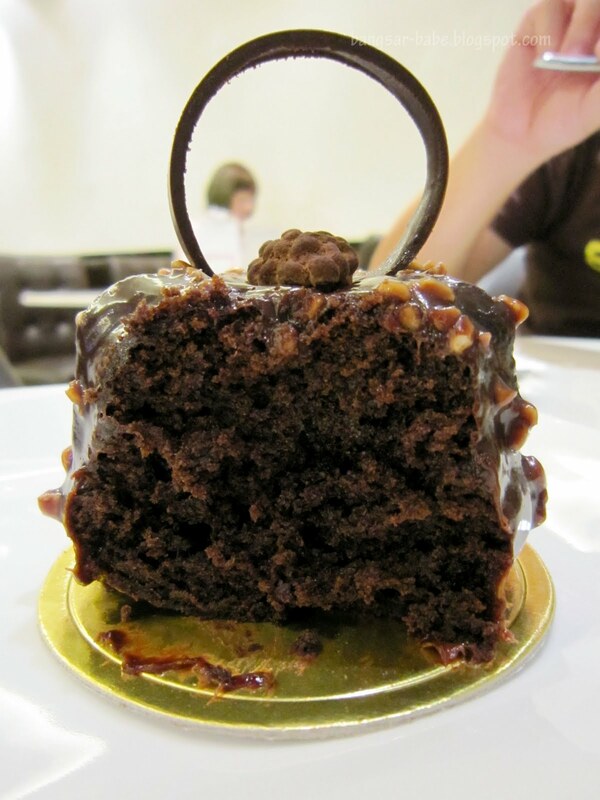 Instead, I ordered the Forêt-Noire (RM10.80) and he, the Dome au Chocolate Amande (RM10.80). rif and I tend to argue a lot when it comes to food choices — whose dish tastes better, whose dessert is more memorable, etc. He would usually win, but this time around, I thought my cake was just as delicious as his. 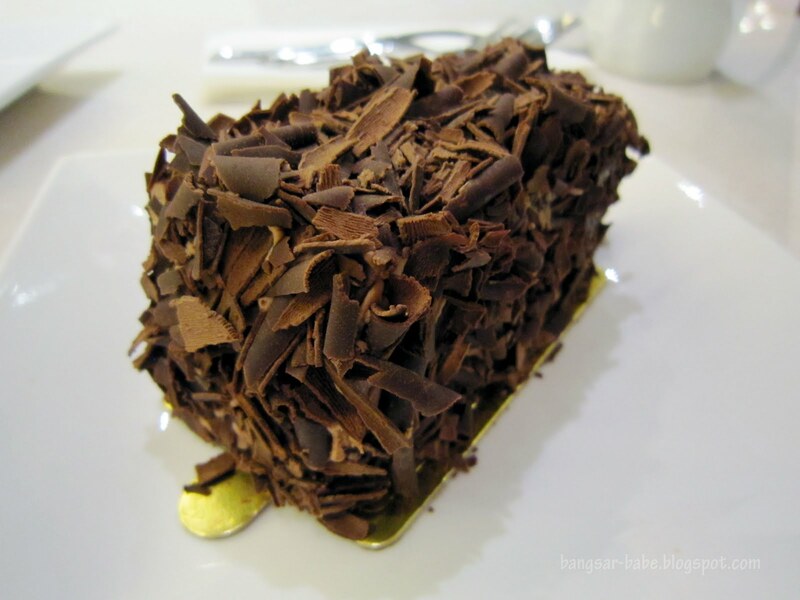 The Forêt-Noire was a rich interplay of cherries, whipped cream and chocolate sponge layers. 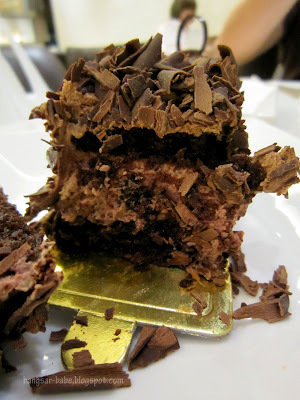 This was moist and deeply chocolate-y with a fruity flavour from the cherries. The Dome au Chocolate Amande boasted a more interesting presentation. 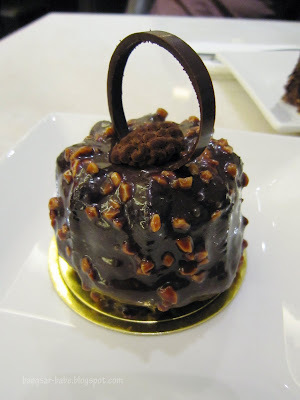 It was a pretty chocolate ball, studded with nuts (hazelnut, I reckon) and topped with a dark chocolate ring. Inside this ‘dome’, was a white chocolate mousse centre. 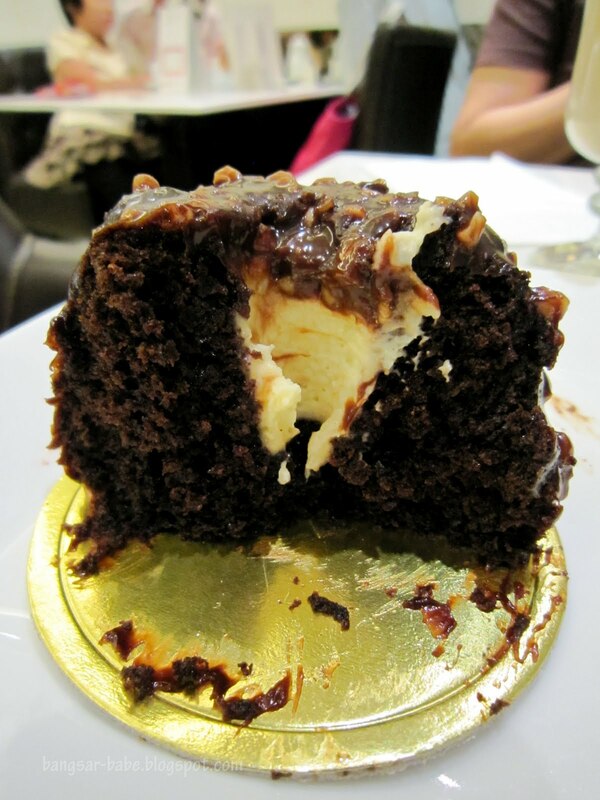 The dense chocolate and creamy centre combination worked really well. No, I’m not going to admit he made a better choice. Both our choices were good. 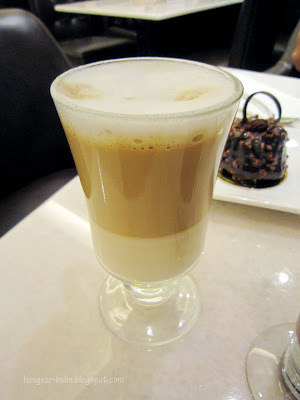 While the cakes were good, I wasn’t pleased with the Latte Machiatto (RM12.80). This was served scalding hot, making it impossible to enjoy. The reason given to me wasn’t good enough to warrant such a poorly prepared latte. Apparently, the coffee turns cold quickly due to the harsh air-conditioning, so they make it boiling hot to counter sip. My Caramel Mocha Frappe (RM14.90) was much better. 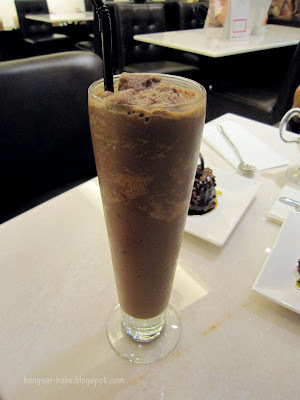 This reminded me of coffee ice cream, and the frappe was blended to just the right consistency. At least for me. I don’t like my ice blended to be insanely smooth; if I wanted that, I’d order a smoothie. The ambience is cosy yet chic. I spotted two families having their cakes and afternoon tea, and a group of girl who look like they were having a girl’s day out. Prices are pretty standard in general, but their coffees are a tad expensive. I’d definitely go back to try more cakes and chocolate, but not the latte. Ever. 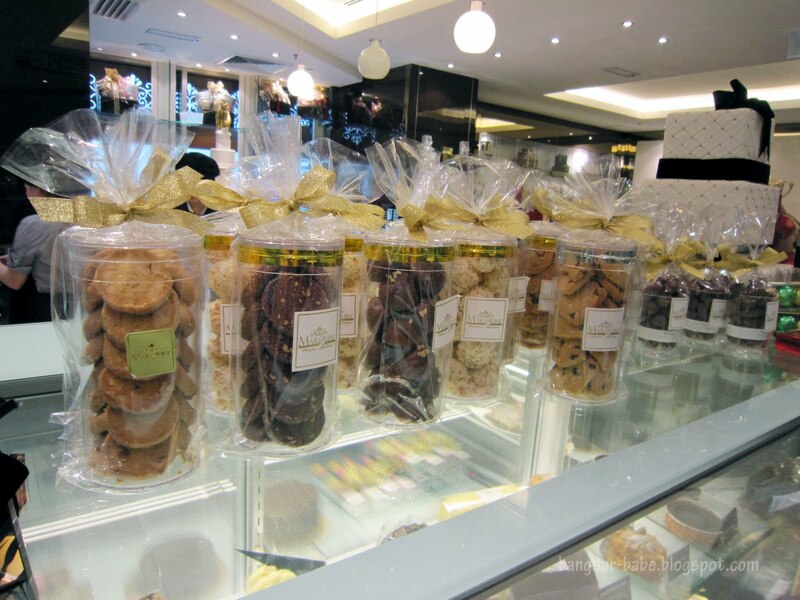 Verdict: A nice place to kick back and relax over sweet treats. wooo..sweets..bcoming a real sucker for sweets recently. OK, got it, no latte ever! I bet they don't do soy anyway so I'm really just left with long black! The correct English for "who's" should be "whose". The Jackal – Thanks for the correction! Wendy – Hope you like it! Hmmm, wasn't too impressed with my first ever visit. Guess it's time to revisit and see if they have improved. Looks like it's a possibility. Thanks for the heads-up. boo – No prob. Hopefully, your next visit will be a good one. 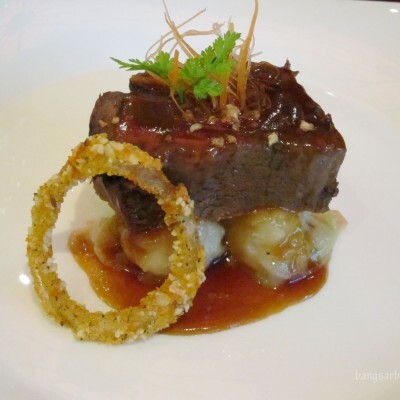 Hi there BangsarBabe, I enjoy looking at your food pics & a casual food blog searcher. 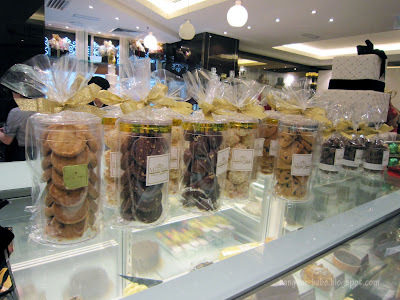 I just bought a whole cake at their kiosk in KLCC. Don’t remember the cake name exactly, something like ‘devil’s choc’. Sorry, the cake itself taste like cheap american choc cake, but the icing & cream is decent enough to be claimed as belgian chocolate. 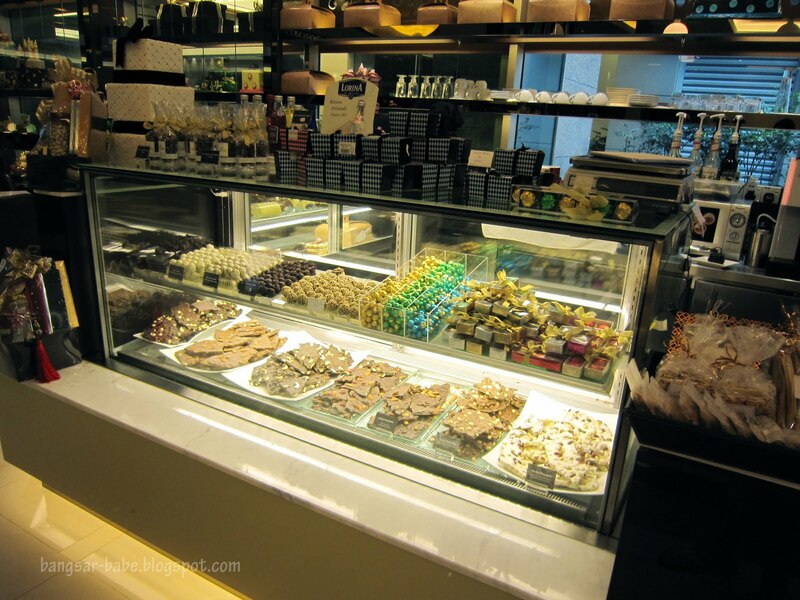 For a real truly belgian chocolate cake experience, try the patisserie in Ritz Carlton in BB. That one is Unforgettable!